Do you ever have days where you are scrambling to get dinner made, but you desperately need to go grocery shopping? 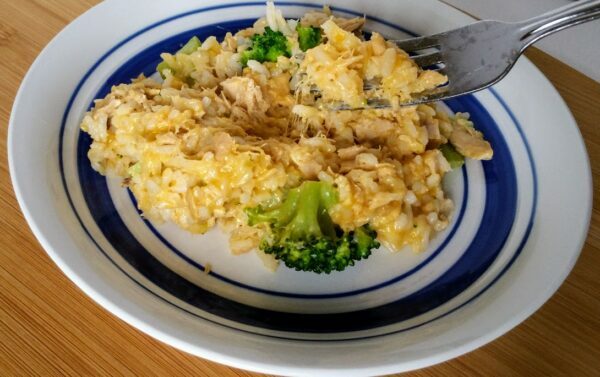 This Easy Cheesy Tuna and Rice One Skillet recipe is a life saver for nights like that. We don't typically eat a lot of tunafish in our house, but we do tend to keep a couple cans stocked in the cupboard. I love how quick and easy it is to make (yay for one pot 30 minute meals!). The flavors are simple and basic so feel free to experiment with seasoning when you make it. Also, it is budget friendly and uses common pantry items, making it perfect for when you have a no spend week or need to stretch the monthly grocery budget. Open your cans of tuna and drain them before adding the tuna to a skillet. Heat tuna on med-high heat while measuring the rest of your ingredients. Add long grain rice and vegetable broth to the skillet and stir. If you do not have vegetable broth, water will work as well. Add as much frozen broccoli as you would like. I used six ounces, but probably could have added more. If the rice absorbs all the liquid, you may add a little more broth as you add the broccoli. Stir and cover for about 5 minutes. Stir in cheese and cover for about 3 minutes or until melted. Whenever I can make an inexpensive meal quickly, I'm happy. 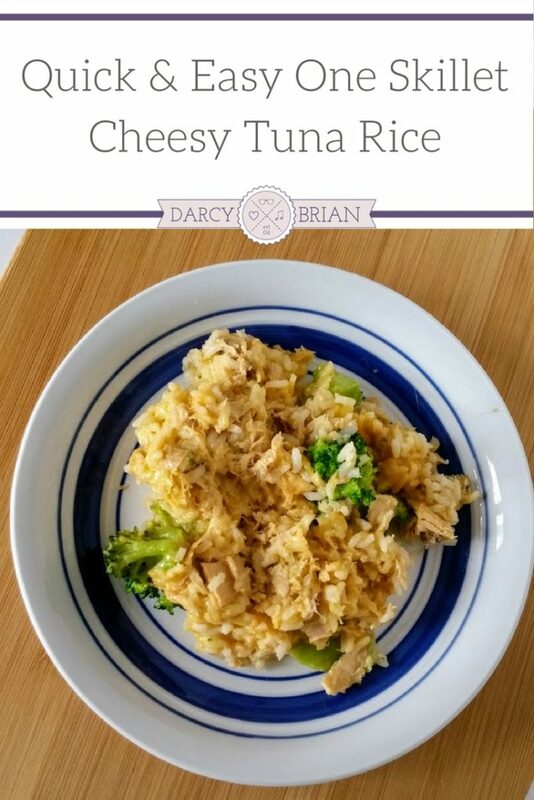 The kids have not tried my Cheesy Tuna and Rice recipe yet since they are convinced they won't like it. I don't eat tuna a lot, but when I do, I prefer it in a hot dish like this one skillet recipe. I hope you enjoy this meal too! I love tuna in any shape or form. This looks like a yummy bunch of ‘comfort’ — will definitely be trying this. This looks delicious! Thank you for joining the fun over at The Creative K Kids’ Tasty Tuesday. I look forward to seeing what you share next week! Thanks, Amanda! It’s a great back up recipe to have just in case! I am all about an easy weeknight meal, especially when it’s a one dish dinner. This one sounds delicious. Thanks for sharing with us at Merry Monday. I thought you were crazy adding the extra 1/2 cup of liquid to the rice but it was spot on! I fixed it and we enjoyed it. I’m so glad you enjoyed it, Chris! Tried your recipe tonight but made some changes. I used chicken stock as it was all i had on hand, and 12 oz of broccoli instead of 6 as you suggested it could take more, and I added about 2 tablespoons of Kraft Mayonnaise with the shredded cheese. I also seasoned it with about a half teaspoon of black pepper and quarter teaspoon of garlic powder. It was very good. Not too fishy or cheesy. A nice blend of flavors. Thanks. Hi Kevin! Thanks for sharing what you added when you made it. Sounds delicious!